When exactly did enterprises become late adopters of technology? We know that they were some of the first buyers of computers. IBM sold tabulating and later computing machines to businesses starting in the 1910s. 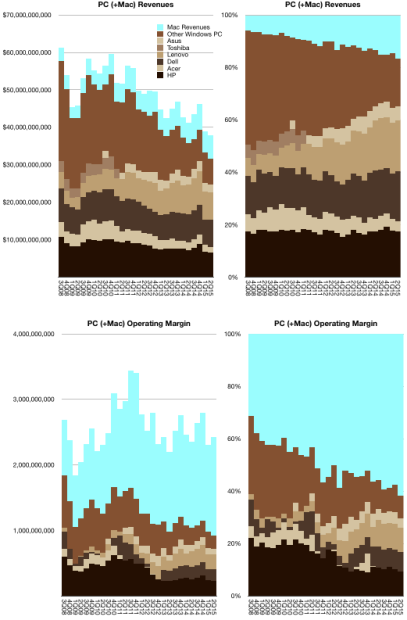 During the 1980s it was businesses which bought PCs in significant numbers to augment, and later replace, their centralized computing resources. Networking was in use in government and in business long before consumers saw any value in it. In my talks I often point out that if you wanted to create a near-monopoly in computing in the 1990s all you needed was to convince 500 people to adopt your technology: the IT managers of the Fortune 500. If the largest companies used your product then they would impose the standard on all their suppliers and distributors and pretty soon there would be no alternatives. So what happened during the last decade or so? Today IT departments are known as the Information Denial department. I recall that when the DVD first became an option on desktop or laptop computers, IT departments were first to decline the option (presumably because it would be used for entertainment rather than work.) When instant messaging first became available, it was IT departments who blocked the ports. When mobile devices with cameras became available signs went up that no cameras would be allowed on company premises. When USB sticks became available, USB ports started getting glued shut. When iOS became available, no devices running it were allowed on the network. Then came Facebook, Instagram and dozens of social media. This pattern of not only a refusal to adopt but an outright ban on new technologies by enterprises made them fall off the radar of technology developers. Quite simply everyone outside the supply chain into enterprises stopped developing new markets around them. From venture funds to developers, enterprises fell out of the business plans. One resolution to this paradox might be that mobility and the movement of processing onto consumer devices increased the cadence of product development to such a degree that the purchase cycle and dollar amounts involved ran out of the range which companies could absorb. A simple way to explain it is this: A company takes longer to decide to purchase a device than the device’s shelf life. In other words, by the time all the salespeople and committees and standards setting and golf playing and dining and site visits would be completed, the object whose purchase was being discussed would be discontinued. This implies that the problem with enterprises is not the stupidity of its buyers. They are no less smart than the average person–in fact, they are as smart with their personal choices for computing as anybody. The problem is that enterprises have a capital use and allocation model which is obsolete. This capital decision process assumes that capital goods are expensive, needing depreciation, and therefore should be regulated, governed and carefully chosen. The processes built for capital goods are extended to ephemera like devices, software and networking. Which brings us to the latest announcement of collaboration between the new disruptor of computing Apple and the vendors supplying Enterprises like IBM and Cisco. Apple was the loser in the standardization of computing during the 1990s but is the winner in the mobilization of computing during the 2010s. The company positioned itself in both cases on consumer computing but it never gave up on enterprises. The approach of Apple seems to be to enable the larger suppliers of technology to enterprises to bundle iOS as part of the acceptable set of services and products. In essence, Apple is complying with the requirement to be slow and expensive in order to be adopted. It can maintain the cadence of product development while attaching itself to the purchase cycle of the enterprise. In a way it’s like an automatic transmission in a car. Operating through gears, the engine can rev at a different rate than the wheels turn. Occasionally, shifting happens but the fluid coupling keeps both the engine and the wheels from absorbing any damaging shocks. But is $20 billion of “transactions” of any significance? For the last few years, I’ve been proposing that the way to conceptualize Google is as two separate entities: Google A and Google B.
Google A was led by Eric Schmidt and Larry Page and Google B was led by persons unknown, but mostly represented by the “Chief Business Officer” Omid Kordestani. Google A spends money. Google B collects money. Google B sends a check to Google A while Google A sends data to Google B (which then sells it on to advertisers and collects money). Google A communicates frequently with optimism and enthusiasm about the future. Google B remains quiet. Google A solves problems of humanity, Google B solves problems for advertisers. In summary, Google A is altruistic, Google B is pragmatic. Google A engages in research, Google B engages in commerce. Google A operates in a structure similar to a Bell Labs for the good of humanity4, Google B operates in a structure similar to AT&T and collects monopoly rents but without any government oversight. This was an effective construct for analysis which explained to me much of how Google operated and how it made decisions. So what do we make of Google’s new Alphabet? Is this a dissolution of the Google B/Google A dichotomy? My initial answer is no. We don’t have a change in this core structure. What we have instead is a split of Google A into Google A and Google A+. A+ is the crème de la crème of the altruistic Google A. It’s the stuff that really does not make money. It’s the laboratory of Bell laboratories. It’s the moonshot manufacturer. It’s the incubator where hobbies are hatched. It’s the funder of ventures. After A+ is carved out, Google A and Google B remain exactly as they were, now under a new CEO. The previous CEO no longer has any day-to-day input in the running of Google A and is no longer soiled by association with Google B. Alphabet is therefore the “holding company” of Google A+, Google A and Google B. I can only suppose that the separation of A+ from A (and the previous A from B) allows the founders to distance themselves even further from the purchase decisions which, through pricing signals, determine where value lies and how resources should be allocated. That must be a great relief. The fact that the iPhone is contributing over 90% of the operating profits in mobile phone sales has penetrated even as far as the Wall Street Journal. However, it’s not yet commonly known that the Mac captures a majority of personal computer operating profits, at least when considering the sale of hardware. 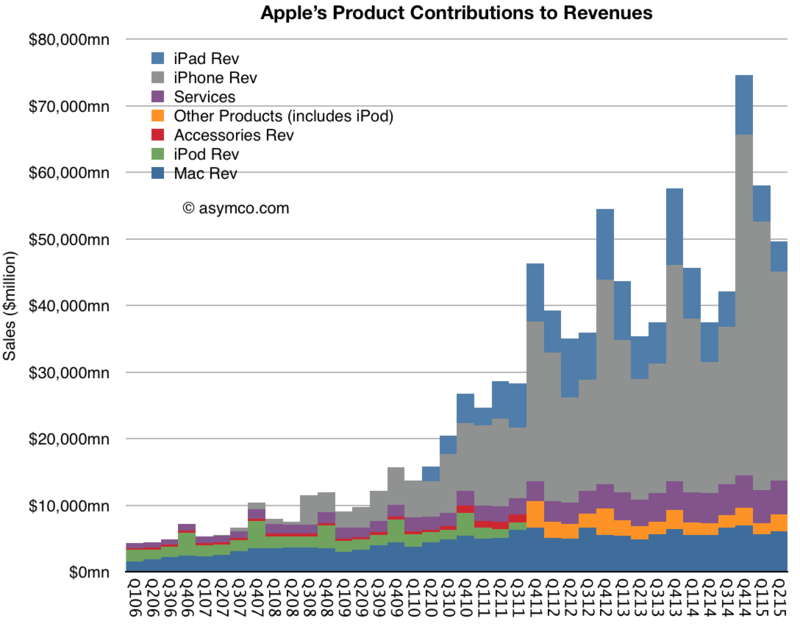 My calculations suggest at least 60% of operating margin in personal computing hardware is captured by Apple. This is mainly due to the fact that the average Mac sells for more than $1200 while the average PC sells for less than $450.That is equivalent to $1.5 billion per quarter for Apple vs. $930 million for all the other PC makers combined. 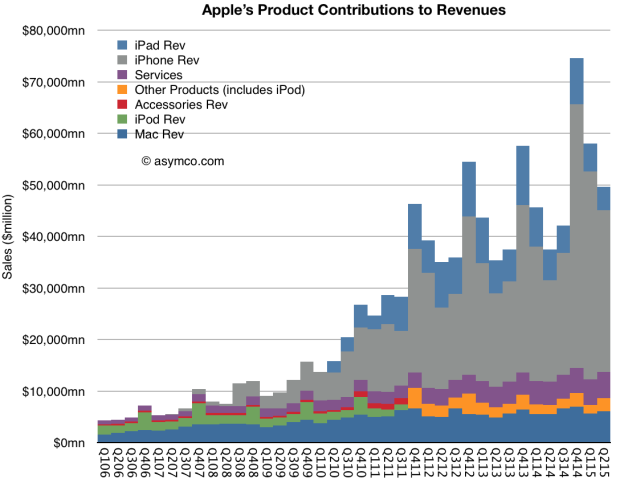 If we are to consider the iPad as a “PC equivalent” computer1 then another $billion/quarter is contributed to the profit pool. It increases Apple’s share of profits to 73%. 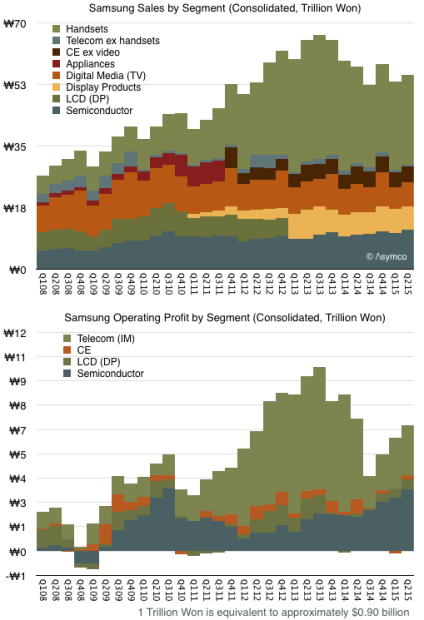 As a result, Apple absolutely dominates computing profits. Katy Huberty (Analyst – Morgan Stanley): You’ve said in the past that the watch may take longer to ramp given the new category and new interface to customers. Is that, in fact, playing out? Is the watch ramping slower than past product categories? Tim Cook (CEO): Katy, when you use the word ramp, do you mean from a — I assume you’re talking about supply? Katy Huberty (Analyst – Morgan Stanley): Yes. Pre-orders and first week in sales and any other data points that you track in terms of interest versus, say, when the iPad launched in 2010? We’ve made progress over the last week or so and we’re able to deliver more customers an Apple Watch over the weekend than we had initially anticipated. We’re going to keep doing that. […] So I’m generally happy that the — that we’re moving on with the ramp. It is a new product for us, and with any kind of new product, you wind up taking some time to fully ramp. From a demand point of view, it’s hard to gauge when you don’t have product in stores and so forth. And so we’re filling orders completely online at the moment. The customer response from people that have gotten theirs over the weekend have been overwhelmingly positive. And we’re far ahead of where we expected to be from an application point of view. To give you a comparison, when we launched the iPhone we had about 500 apps that were ready. When we launched iPad, we had about 1,000. And so our internal goal was to be able to beat the 1,000 level and we felt — we thought it would be great if we were able to do that by a little bit. And as I’ve mentioned before, we now have over 3,500 apps in the App Store for the Watch. And so we couldn’t be happier about how things are going from that point of view. We are learning quickly about customer preferences between the different configurations. There’s a much larger breadth of possibilities here for customers than in our other products. And in some cases, we called that well and some cases we’re making adjustments to get in line with demand. But I’m really confident that this is something we really understand how to do and will do. And so I’m really happy where we are currently and happy enough that we’re looking forward to expanding into more countries in late June. Gene Munster (Analyst – Piper Jaffray and Co.): …question for Luca, in terms of any thoughts on what the margin impact from the Watch as that ramps over the next couple of years? Luca Maestri (CFO): Apple Watch is, not only a new product, but it’s a brand new category with a lot of new features, a lot of new innovative technologies. 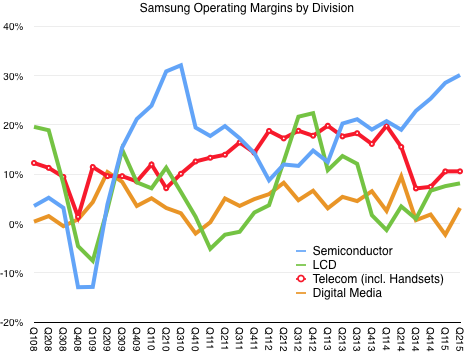 And Apple Watch margins will be lower than the Company average. Toni Sacconaghi (Analyst – Bernstein): I just wanted to revisit the watch. Tim, I think you said when you were talking about your new products, you said we’re, quote, very happy with the reception. And in response to a previous answer you said, relative to demand, it’s hard to gauge with no product in the stores. I would say relative to other product launches where your commentary around demand was characterized by superlative after superlative, that assessment feels very modest. And part of the reason that I ask is, A, are we reading you right in terms of that? But if we look at consensus, consensus is expecting that Apple will ship more watches in its first two quarters than it did iPads, despite, as you said, very limited distribution in terms of only selling through your stores. So I’m wondering if you can talk a little bit about putting those demand comments in context, given that they do seem different from how you’ve characterized product demand for other products. And how, if at all, we should think about the modeling demand in the context perhaps of the iPad, which was your most recent significant new category? And then I have a follow-up, please. Tim Cook (CEO): I’m thrilled with it, Toni. So I don’t want you to read anything I’m saying any way other than that. So I’m not sure how to say that any clearer than that. And in any situation, whether it’s the watch or in the past on iPad or on iPhone, when demand is much greater than supply, it’s difficult to gauge exactly what it is. And so, as you know, we don’t make long term forecasts on here. We maybe forecasts for the current quarter. And so I don’t want to make any comment about the consensus numbers. Honestly, I haven’t even studied those. We’ve got enough to think about here. I feel really great about it. The customer response, literally from what I’ve seen, is close to 100% positive. And so it’s hard to imagine it being better. Excerpts from Apple Earnings Report: Q2 2015 Conference Call Transcript, April 27, 2015.